“On September 11, 2001, Donald Trump, then just a New York real estate mogul, called into a New York TV news broadcast as the station aired footage of the World Trade Center attacks and claimed that his property at 40 Wall Street would now become the tallest building in the area. Back then, he was a thinner, less orange, turd. Edited 1 time(s). Last edit at 09/11/2018 10:30AM by btfc. So you're saying that the man actually WAS celebrating when the towers came down, just like those people he claimed were jubilant in New Jersey? Did you notice he said "thank you" at the clapping when he finished his memorial speech today. He kissed Melania on the cheek (she offered a cheek) then they held hands. She must be complicit in his unpresidential behavior. Or unhusband like behavior. The double clenched fists walking from the plane is getting boos from Social Media as well it should. Edited 1 time(s). Last edit at 09/11/2018 04:01PM by samintx. 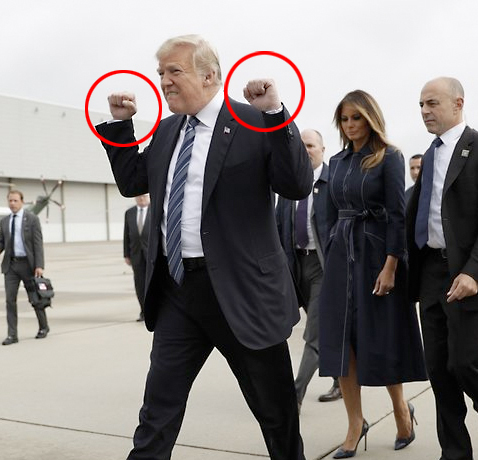 I've been trying to post a picture of the idiot doing the double fist pump, but it's not working. Yeah, this gets a big meh from me. The then-presidential candidate said at a rally in Birmingham, Alabama, that people had celebrated the disaster across the water from the Twin Towers. He later repeated his claim to ABC News host George Stephanopoulos, adding that the cheers came from areas of New Jersey with “large Arab populations”. The claims were denied by Jersey City Mayor Steven Fulop and police. Here we go; here's the insane idiot on his way to the 9/11 memorial.